On Thursday whilst at The Hindu Temple (working on the project making memories) the ladies gathered round the table to embroider. A buzz of conversation, laughter and activity filled the room. 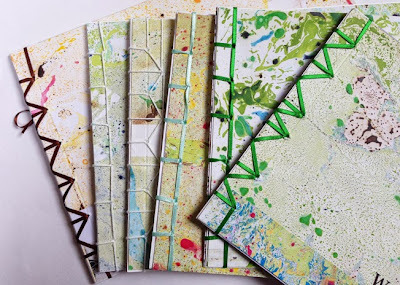 There is something magical about a shared creative activity, a chance to gossip, let your hair down and forget mundane everyday tasks for a while. I asked the women for their thoughts on the topic. You don’t feel the same when you’re stitching on your own. It becomes more interesting when you’re working together- you feel more like doing it. We even start singing sometimes when we are doing it. We used to do the saris together, put sequins on the saris and metallic thread, whatever was the fashion. Friends, family would all get together. 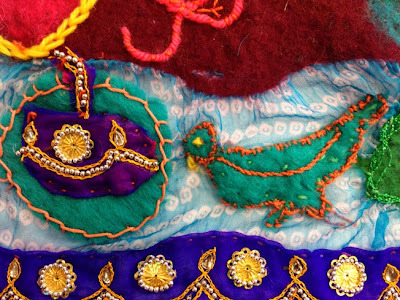 Embroidery, making the pickles, papadums, all sorts of things we would get together to make. In the olden days women would have stayed at home, never work, so there was more time to look after the family and embroider. Cooking was done early in the morning, the main dinner eaten at lunch. Men came home unless working further away, then they’d take tiffin. We’d have a get-together in the afternoons, exactly like this, but in peoples houses- looking after the children at the same time. At a young age girls would be forced to sit down with us, you have to learn all these things. All taught from a young age. We’d serve tea and savory things. Before marriages we would all sit together and make arrangements and rituals, sit and talk together. 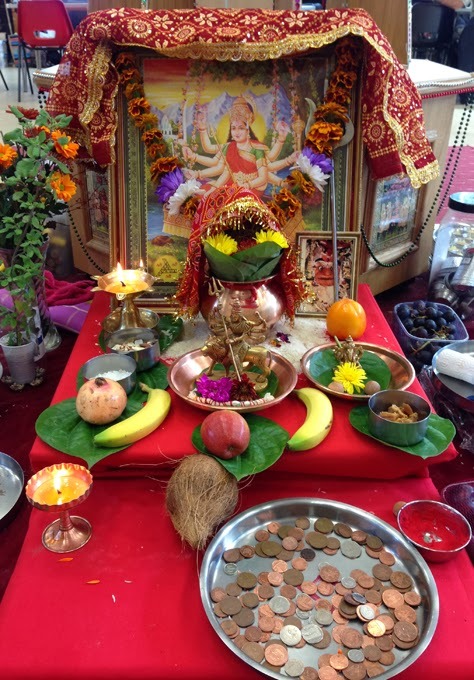 So many ritual before marriages. 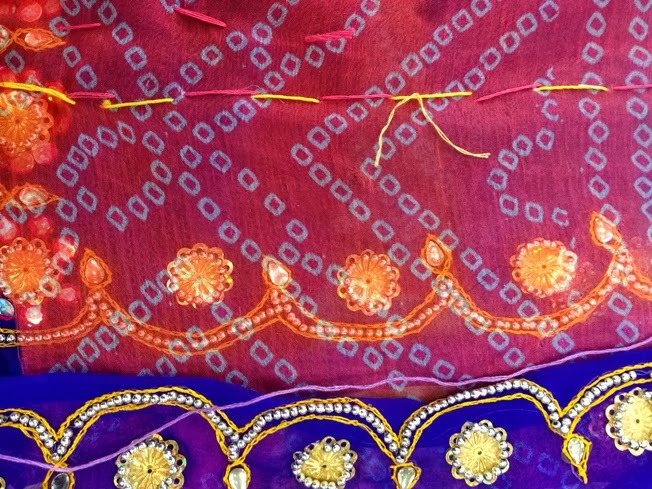 We make one colour scarf for everyone, embroider the boarder, a duppatta. When we’re in prayer, in front of God we cover our heads. 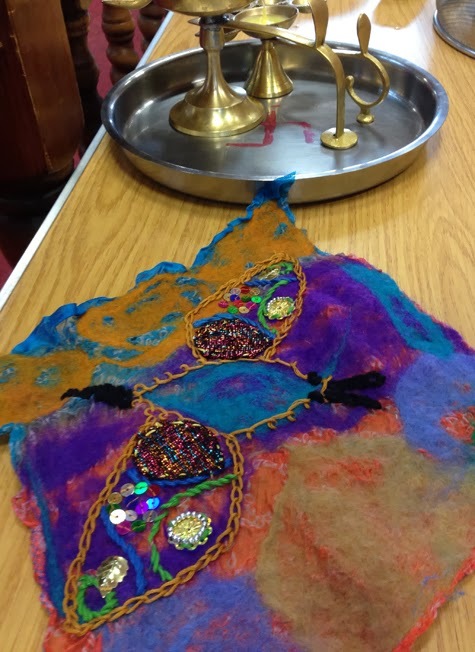 As part of the project making memories arthur+martha are working in a Hindu Temple in Oldham, devising new ways of working creatively with reminiscence boxes. Yesterday I took in some dolls I was given as a present many years ago. I knew they were Indian, but nothing else about their heritage. I was interested to find out what memories they sparked. 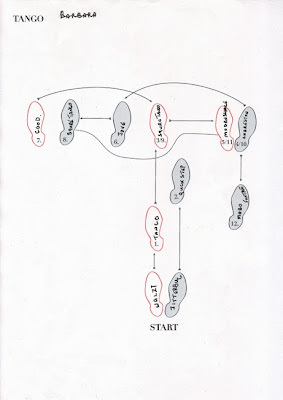 The following notes share some of the groups reminiscence. The dolls are usually in pairs, they are Kathputtey (or Kathputli) a puppet like Punch and Judy from Udaipur in Rajasthan. 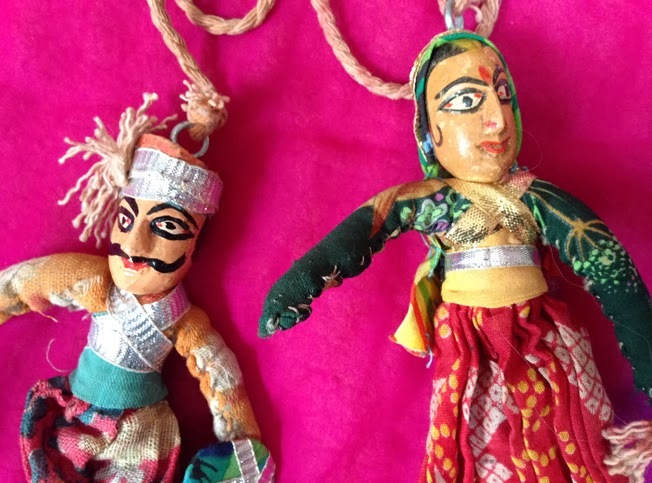 The puppet show tells a story, a traditional tale. 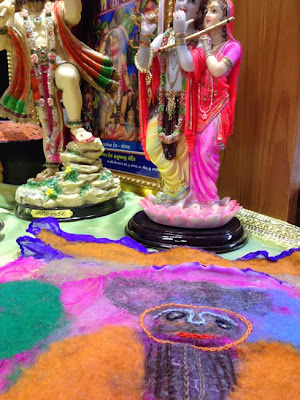 Their hands, feet and head are controlled with thread. Kathputali means statue made from wood. Its beautiful, at night you have an hour show, all professionally done. (Vimra) We couldn’t afford dolls, so my mum made a hand made doll- everything was handmade, using all sorts of materials, including wood. I remember my favorite was a metal stove made for us, you could cook on it, it looked like a miniature barbeque, no more than 4inc’s with drawers you could pull out in the side. My parents would put coal in it for us, and we’d make tiny pures. We had skipping ropes and marbles and stones to juggle and flip on the palm. I grew up in Kenya, Mombassa. 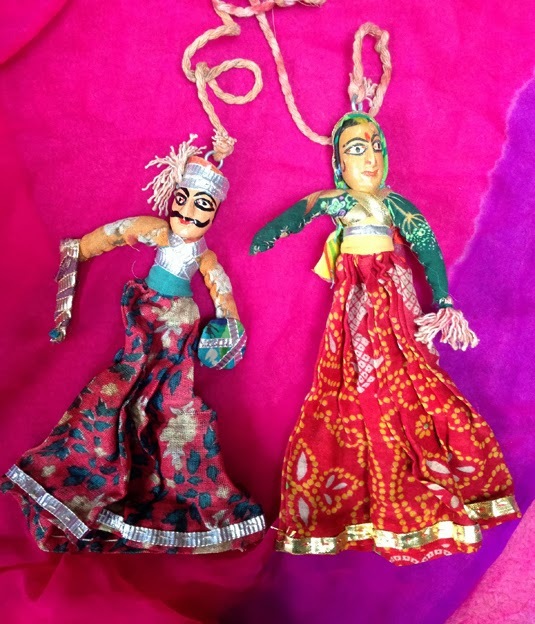 We had rag dolls stuffed with old cloths… saris and socks. It was a pink doll with an egg shaped face. The eyes, nose and mouth were painted and sewn with different coloured thread. No clothes just its pink body. 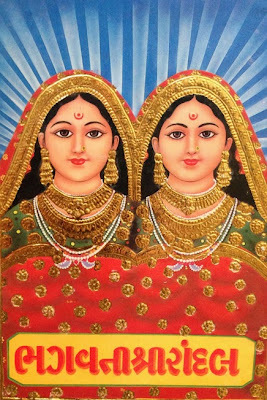 (The female doll has a bindi painted onto her forehead) The bindi, is the symbol of a married woman, sometimes worn with some colour in the hairline. Now its become like fashion, now the colour matches the clothes, the sandals, bangles... traditionally it’s red, an auspicious colour, the main colour for weddings. 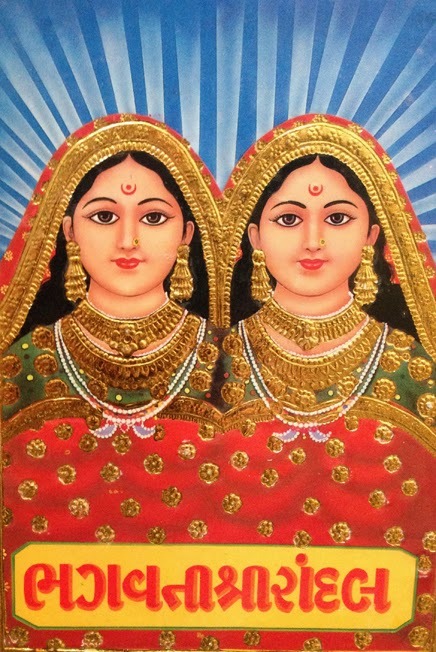 In different parts of India, different colours, green in some parts of India, and in Maharashtra the widows have a black bindi, in South India widows have sandalwood bindis, in some parts of India a widow can’t wear a bindi at all. In the villages widows still wear black or white clothes and she’s not allowed colourful bangles, only gold. My aunt was made a widow in her 20s, she wore white all her life, we felt awful for her. When my husband passed away, she told us not to wear white. Gold is the tradition, for a ‘rainy day’ as well, it’s a type of savings. You sell in emergency. We need so much gold when you get married, a daughter is given a lot of gold, a dowry. When the father passes away, she doesn’t get a share, she has had the gold already. Gold had to be passed down. The mother-in-law shares gold between all the girls, daughters, daughter-in-laws. We're working in a Hindu temple in Oldham as part of our Making Memories project with Gallery Oldham, funded by the Barings Foundation. 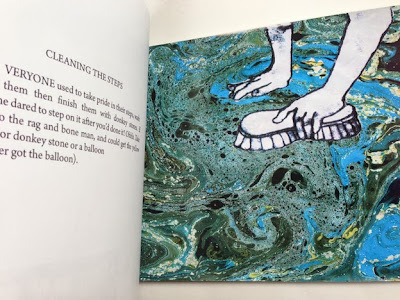 This poem by Hansa delicately explores the relationship between objects and memory. What has been fascinating about this newest phase of our project is the shift between cultures that simply walking into the temple necessitates. 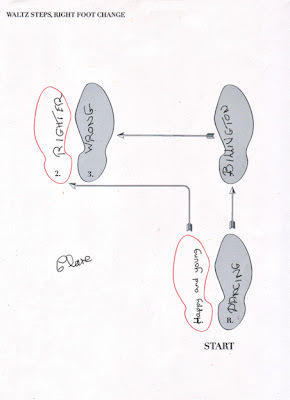 There are of course lots of discussions about hopping between languages, from English to Gujarati, to Sanskrit and so on. But also we're constantly moving between times, from past to now and back. the deer will not get into his mouth. clothes hanging from his cart. come on let's get the washing done. made to measure for our new life in England. Today was all about a tablecloth. 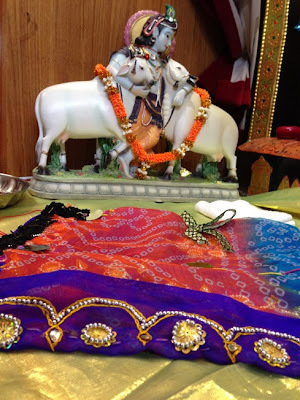 We're running reminiscence art sessions at a Hindu Temple in Oldham, exploring the power of objects to evoke memory. 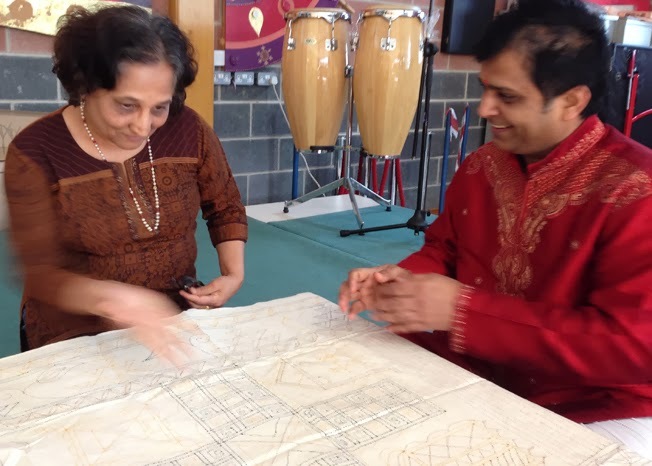 It's our first project with the Hindu community and there's much to learn, as the tablecloth demonstrated. It was bought by Lois some 20-or-so years ago when she as a student. On it are are series of stitched designs that sketch the outline of a pattern, to be embroidered to your own taste. (rather like the flower embroidery transfers for tablecloths, popular in the UK in the 1930s and 40s). I showed the tablecloth to Trupti and she began to decode it for me. In the middle are the squares of a game, a little like Ludo but much more complex, which can be played after the meal is finished. 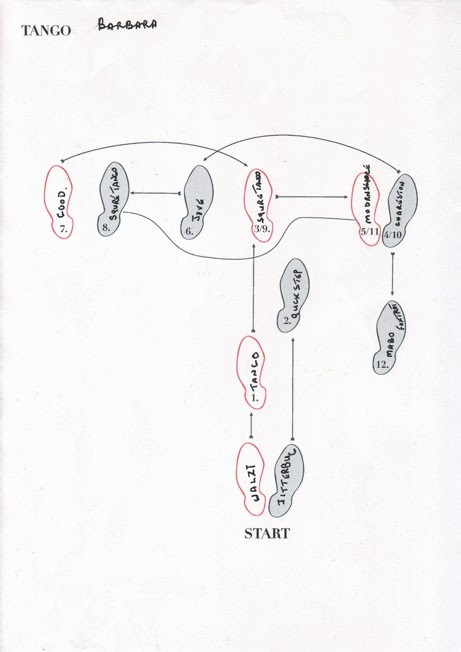 The game Chaupad (English spellings vary dependent on who is translating) makes an appearance in the Mahabharata and is well-known throughout India, going back many centuries. In legend, a king who is over-fond of gambling is duped in the game and loses his kingdom. The cloth can double as a wall hanging – if you hang it vertically, it becomes apparent that it is the outline of a house. Two girls play outside and above are two peacocks. The squares of the game have become windows. 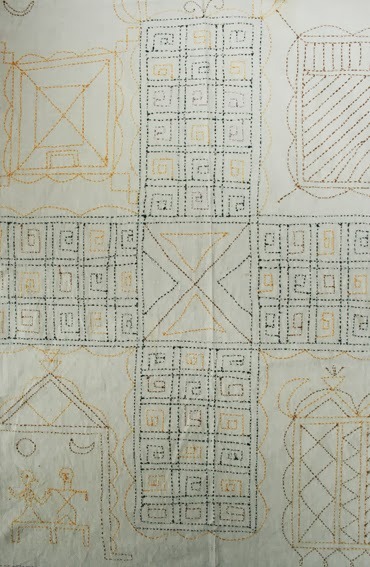 Patterns like this appear on the walls of many houses in India. The house that Trupti lived in was decorated in this way too – the wall decoration in her house was dated 1756. It had lived not only in her minds-eye, but in the eyes of many, many others who'd lived there. At this tablecloth the family meets, eats, plays, prays. As Trupti talked, more and more layers of memory were uncovered and we journeyed with her across the vast expanse of this small, seemingly simple piece of cloth. Navratri is currently being celebrated for 9 days and nights in The Indian Temple, Oldham. 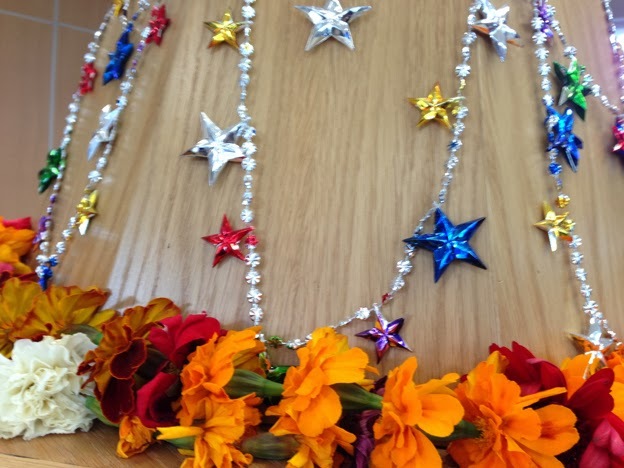 A colourful shrine, decorated with flowers and fruit, had been built in the centre of the room, a bustle of activity and conversation surrounded our workshop for the project Making Memories. Today the group continued with their embroideries, adding elaborate decorations to their Nuno felts. Whilst we worked, I took notes of conversations. The following records Sushilia discussing her introduction to embroidery. I had a little daughter, when I go shopping I see designs, when I come home I remember the design in the shop window, I cut a piece of paper for the design, I make it- a dress. I used to sew on the blouses, the small frock for my little sisters, saris, table clothes, all embroidered with sequins, sewing on the machine with a frame. I just learnt. Who would teach me? my mother was busy cooking, and so many children. I was studying at school. As you stitch, you learn more, you teach yourself. I was just interested. 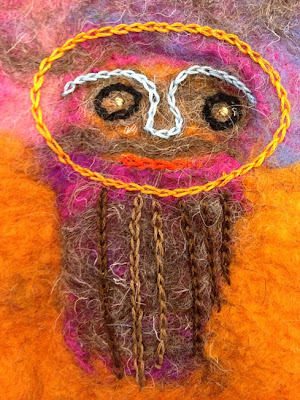 Sushila's embroidered nuno felt, detail. 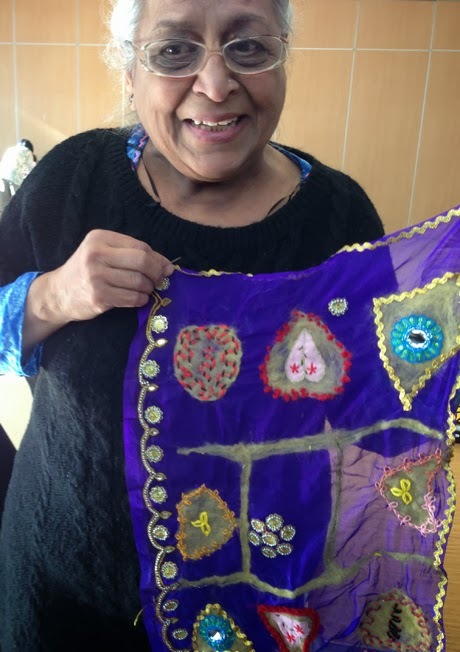 The project making memories with The Indian Association in Oldham, is taking its own direction. Like a run-away train, the groups enthusiasm and talents are leading us their own way. I had envisaged the nuno feltmaking would only be for one week, however more people kept joining the group, and the felt making work spilt into another week. 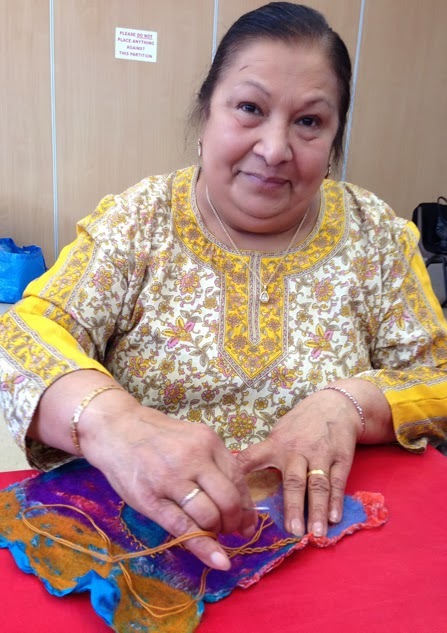 That week saw the start of the embroidery, that took off, with more interest and excitement, that spilled over into this week, now participants are decorating their felts, adding symbols, birds and faces, taking their work home to add more colour and texture. It was such a success, the ladies didn't want to move even when lunch arrived. These lovely pieces will (in theory) be finished next week, and new ideas introduced, inspired by our conversations of yesterday. My notes are below. "Old sari's used for quilting, folded over and over, stitched through. In India nothing is wasted- even a lightbulb, they crocket over, not even a lightbulb they throw away. A Rajia, a quilt in India, or Gudadi, a different name- its Gudadi in the villages, and Rajia in the cities, a quilt here! They're still being made, nothing is thrown away. Used to do it by hand, now its done by machine- and my children don't even know how to thread a needle! 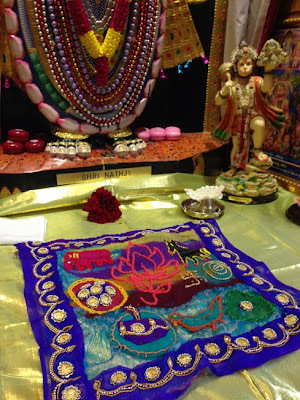 The old cotton sari's are used for paintings, they're put on the wall and painted like a canvas, stretched onto a wooden frame, that's a new thing in India. 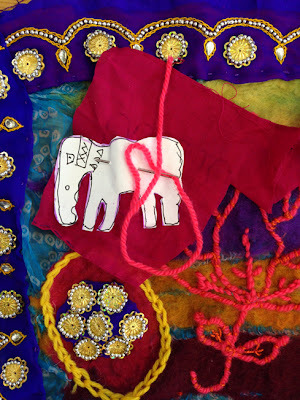 We used to make floor mats, taking 3 strips of sari's and plaiting them together. 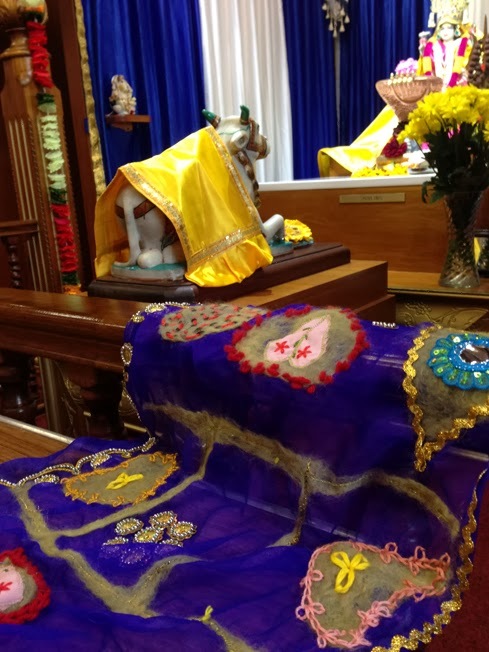 Used them for praying to God, made a very soft mat when sat on, making some good designs on them. I love stitching, when we were young there was no telly, our parents started us stitching, I made at least 10 bed covers, table cloths- no telly at that time. Summer time work to do. Our parents saying, you are girls, you stay at home." A previous week, whilst working with Phil, Pratima wrote the following poem. 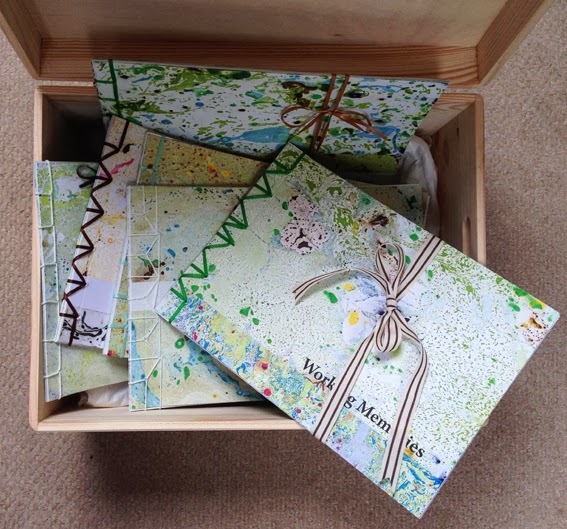 Our project making memories, is all about finding new creative ways with Memory Boxes. 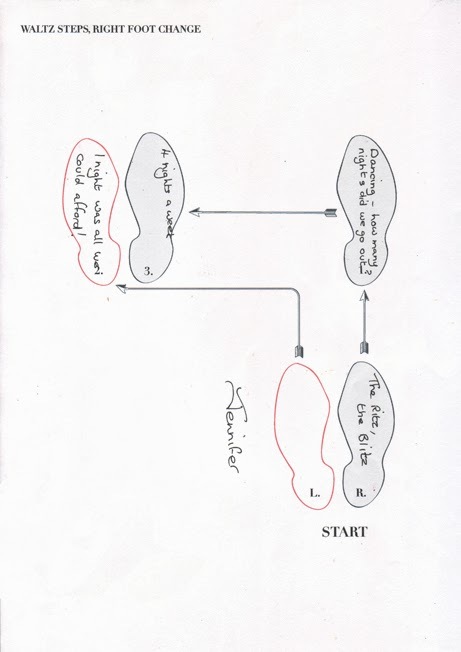 Following on from our reminiscence art session about dancing at Limecroft, I decided to try out a mash-up of two drawing exercises, combining an exercise inspired by the artist Paul Klee famous quote about drawing 'taking a line for a walk', and drawing/mark making drawing/play to music. Limecroft is a respite home for people with dementia. Music has often shown a dramatic effect on people with dementia, it can soothe, stimulate and bring to mind long forgotten memories. It seems to reach parts of the damaged brain that other forms of communication cannot. I brought along a variety of music, from classical to jazz to Frank Sinatra to Latin to The Beach Boys. Each track brought a slightly different atmosphere, a different tempo. 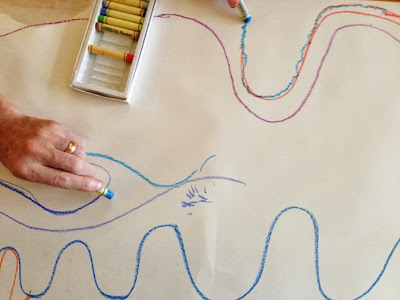 I encouraged individuals to 'play a game', to explore the materials and make marks on the paper that express a response to the musical sounds, rather than drawing what they see, they were drawing what they feel. 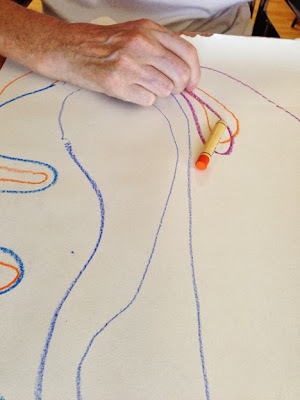 For this group it was a success, one man at first sat with arms crossed, refusing to pick up the wax crayons, however witnessing the others joining in, soon was fully engaged himself in the activity and became one of the most prolific of the group. 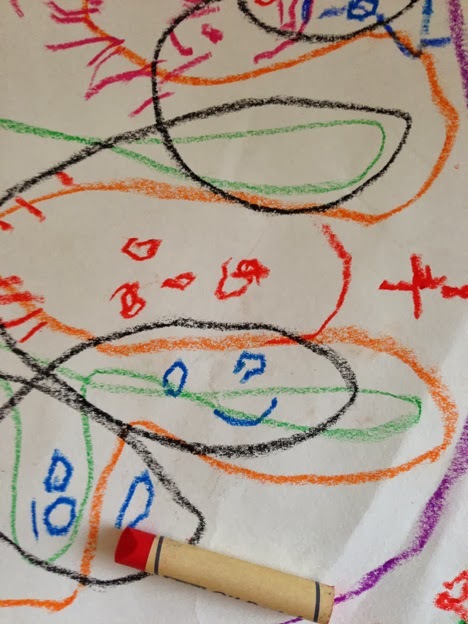 We started really gently, passing one crayon from person to person quickly turning the large scary blank paper into something more friendly- and then as peoples confidence grow, they chose their own colours and started their own play. 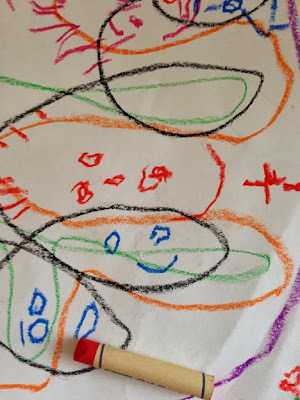 Without prompting some of the group started doodling with their lines, finding inspiration out of the lines and music to create faces, or animals.. I believe these exercises are a great way of building confidence in self expression, getting over the fear factor of drawing, challenging our understanding of what drawing is, are fun and stimulating. And I would definitely encourage anyone putting together a memory box, to include a wide range of music in there, and keep refreshing it, to activate parts of the brain that other activities can't and just get the toes tapping.